"I developed this recipe to liven up the traditional pumpkin bar. My family says it's the best pumpkin bar they've ever had. This bar is dense and moist." Preheat an oven to 350 degrees F (175 degrees C). Grease and flour a 10x15 inch baking dish. Whisk together the flour, salt, baking soda, baking powder, cinnamon, and pumpkin pie spice in a bowl. Beat the eggs in a mixing bowl. Whisk in the white sugar, canola oil, and pumpkin puree until no lumps of pumpkin puree remain. Stir in the carrots and pineapple, then fold in the flour mixture until no lumps of flour remain. Pour into the prepared baking dish. Bake in the preheated oven until a toothpick inserted into the center comes out clean, 25 to 30 minutes. Cool completely in the pan before cutting into squares. While the pumpkin bars are cooling, beat the cream cheese, butter, vanilla extract, and confectioners' sugar together in a bowl until smooth. Frost the cooled bars with the cream cheese frosting. These moist, cinnamony pumpkin bars have a rich cream cheese frosting. Simply fantastic!! The only change was that I used an 9x13 and baked about 15 minutes longer; otherwise this recipe is perfect as-is. I'll make this again and again. Awesome recipe! Have made this twice now and eveyone loves it. I also ended up using a 9x13 inch pan because that was the largest I had on hand. Comes out just like carrot cake. YUM!! 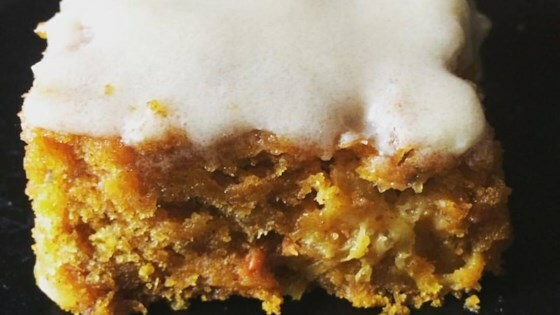 I absolutely love these pumpkin bars. They are extremely moist and by far the best that I have ever made. I followed the recipe to a T.
Bars taste fantastic! Very quick and easy recipe! I used a little over a 1/2 cup of oil and the bars still turned out very moist. Will be making them again! These are unbelievably delicious - the cream cheese frosting takes 'em right over the top - will be making again!